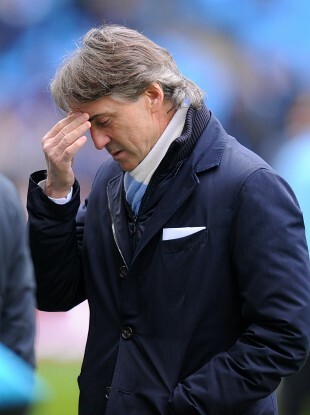 It's been confirmed tonight that Roberto Mancini has been sacked by Manchester City. ROBERTO MANCINI’S DISMISSAL as manager of Manchester City, which was confirmed on Monday after weeks of speculation, would have been almost unthinkable 12 months ago. The Italian walked on water in parts of Manchester in May last year, after leading the club to a dramatic first league title in 44 years, a season after success in the FA Cup ended a 35-year trophy drought. His reward was a new five-year contract, reportedly worth £25 million ($38.4 million, 29.6 million euros), and he spoke of his desire to “build on our recent success”. One year on, he finds himself without a club and with a dent in his reputation after City fell well short in their league title defence, limped out of the Champions League in the group phase, and were stunned by Wigan Athletic in the FA Cup final. Mancini has protested throughout that in leading City back to the top of the English game after decades in the wilderness, he has achieved all that could be expected of him. He has also lamented City’s lack of impact in last year’s close-season transfer window, having seen Robin Van Persie head to Manchester United and Eden Hazard settle on Chelsea after each player rejected overtures from the champions. Mancini laid the blame for these setbacks squarely at the door of the club’s board for moving too slowly, and even went so far as to claim that had City signed Van Persie, they would have been champions and not United. City certainly lacked fire-power. Having romped to the title with 93 goals last season, an average of 2.45 per game, they have hit the net an average of just 1.72 times per game this season — only the sixth-best figure in the league. However, while Van Persie might have helped turn some of City’s nine draws into wins, it does not explain why the match-winners Mancini did have at his disposal suddenly appeared to lose their bearings. Sergio Aguero found the net 23 times in 2011-12, including the stoppage-time winner on the season’s final day that wrenched the title from United’s grasp. He has scored just 11 in the league this term. Creative midfielders David Silva and Samir Nasri have been deeply disappointing, while Vincent Kompany and Yaya Toure are no longer the rocks upon which City founded last season’s title triumph. Even Joe Hart’s form has dived. The best goalkeeper in England last season, Hart has produced a number of poor performances, with high-profile blunders in games at Sunderland, Southampton and West Ham United. Mancini’s man-management has also come under scrutiny, despite his success in managing to sell the combustible Mario Balotelli to AC Milan in January. Nasri hit out at him after Mancini claimed he wanted to “punch” the Frenchman for his inconsistent displays earlier this year, while Hart was rebuked by the manager for criticising the side following a 3-2 Champions League loss at Real Madrid in September. That brusqueness has reportedly angered members of City’s playing staff, while Mancini’s complaints about the lack of depth in his squad — despite the massive investment by the club’s Abu Dhabi-based owners — will not have gone down well in the boardroom. After the FA Cup final, Mancini criticised the club for failing to publicly deny media reports identifying Malaga boss Manuel Pellegrini as his likely replacement. However, with strategy at board level now partly in the hands of former Barcelona directors Ferran Soriano and Txiki Begiristain, Mancini will have realised some time ago that too many false moves were likely to cost him dearly. Despite his disappointment, Mancini will have heard the City fans chanting his name at Wembley on Saturday, and as the man who brought the glory days back to the blue half of Manchester, he will not want for sympathy. Email “Analysis: How Mancini's Man City dream turned sour”. Feedback on “Analysis: How Mancini's Man City dream turned sour”.